Sanghwang mushroom (Phellinus linteus) is known to have the best anti-cancer effect among all plants in Korea thanks to its rich β-glucan contained. What makes Jirisan New Hope Sanghwang Mushroom unique is because the CEO Kang Tae-wook has cultivated this god's given sanghwang mushroom for tens of years as a family business without using any agrochemicals at all. Kang says "Ancient medical books record that sanghwang mushroom has no toxic but controls the toxic. Dongui Bogam tells it improves symptoms of seborrhoea and tumor and Boncho Gangmok tells it improves symptoms of bloody discharge, stomachache and leukorrhoea. Also, it is recorded to have amino acid, fatty acid, enzyme, K, Ca and vitamin B." A recent report says, based on a test, that β-glucan in sanghwang mushroom suppresses cancer cell; the test shows that β-glucan encourages cancer cell to kill itself. The best way to intake this seemingly cure for all sanghwang mushroom is by boiling. The color appears either yellow or light yellow when boiled and it has no taste and smell but gives a feel of cleanness and gentleness; it is best kept in fridge as mold start to grow otherwise. 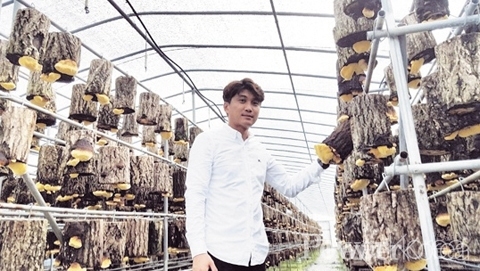 Cultivating this heavenly mushroom started from Kang's father and mother and Kang is the second generation to keep this family business. "I was offered a number of places from promising companies after graduation. But I thought it better to run the family business since being a farmer has no retirement. And I found that farming is one of the most honest jobs we can have as we reap what we sow." Kang's belief and hard work were well paid off in 2014 and the following year by receiving an administrator's prize from the Rural Development Administration and in 2017 a ministerial prize from the Ministry of Agriculture, Food and Rural Affairs. He also appeared on KBS <Hometown Report> to spread excellence of Sanghwang mushroom. "I was really happy and proud to receive those prizes. But I'm most happy when my mushroom helps people improve their health because that's the foremost reason I do this business."